In late 2005, Konica Minolta announced they would be selling off their photo imaging department to Sony Corp. This camera is no longer in production, but all lenses and accessories from Konica Minolta will work with the new Sony a 100 DSLR. The Maxxum 5D is Konica Minolta's entry level D-SLR, featuring an anti-shake system that's built into the camera body, so every lens has the equivalent of image stabilization! If you're a Minolta film camera owner with a few AF lenses sitting about, rest assured nearly all will work just fine on the Maxxum 5D 6.1MP digital camera. It's a tough market out there, with new D-SLR's coming out at a record pace. Can Konica Minolta's latest addition pounce over the competition? Note: In some countries the Maxxum 5D is known as the Dynax 5D. I bought the "kit" which includes the AF DT 18-70mm lens for $854 + tax on 11/05. Here's what I received. Printed manual, both English and Spanish included. You have just about everything you need in the box to begin taking pictures except a memory card. Since this camera uses compactflash cards, that's what you'll need to buy. I bought a 512mb card which yields 81 shots at the extra fine large setting, 160 at large fine and 272 shots at the large standard setting. RAW + JPEG equals just 39 pictures. 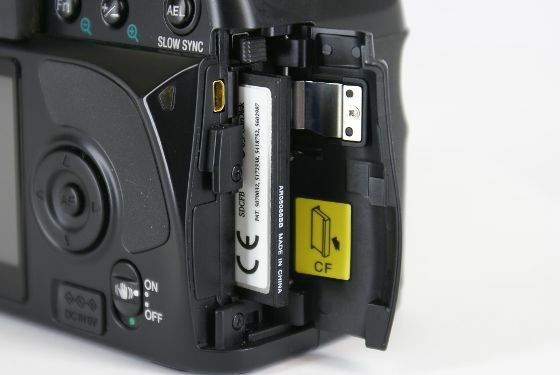 Do note when inserting the memory card, you will need to keep the back side towards the back of the camera. The front of the card has the large print with the capacity and makers name, it will only go in one way, so don't try to force it. Believe it or not some reviewers show the card half way in the slot but in the wrong way! Before you begin your photo excursion, you'll need to charge the lithium-ion battery, which under normal circumstances will take approximately 2.5 hours. The company claims you can take up to 500 pictures on one charge, and I can verify that from use. There are some accessories you might want to check out, most notable are lenses. I've tested all the AF DT lenses to date, plus a few more so be sure and read the reviews. Don't forget; all your old Minolta AF lenses will work too! There are several separate flash units available, if you need something extra besides the built in pop up flash. This camera supports high speed sync with certain flashes; the 3600HS (D) and 5600HS (D) you can buy two different ring flashes for macro work. Other items include an A/C adapter, the standard carrying cases, and two remote control cords, one at 18" long and another at 15 feet. No option for a wireless remote. The software supplied with the camera is DiMAGE master lite vs 1.0.1, which provides everything you need for this camera, including RAW editing. On the main screen you'll find thumbnail views, a "folder tree," a histogram or preview, then EXIF data with basic info or detailed info. In detailed info you get every detail you can think of, including the lens used and color temperature. I was quite surprised at seeing the color temp listed on a JPEG image, plus the added luxury of knowing what lens you used without having to shoot in RAW. Speaking of RAW, I'm not overly thrilled with the editing capabilities of master lite. You get the basic features only, which kind of defeats the purpose of shooting in RAW. DiMAGE master lite vs 1.0.1 is ok, but nothing special. 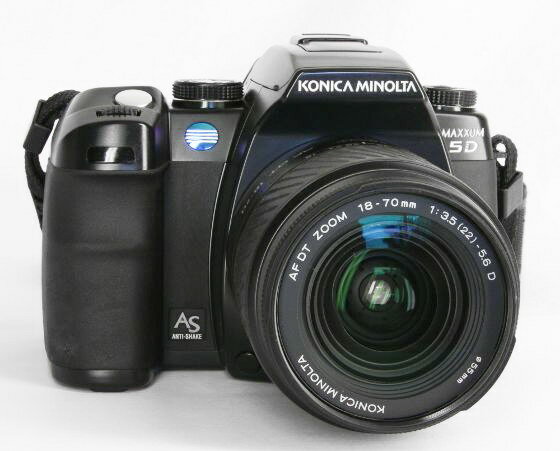 So enough with the introduction, let's take a look at the Konica Minolta Maxxum 5D! This is a fairly typical D-SLR camera these days; a black colored body with a large right hand grip, metal frame encapsulated in plastic with fold away flash that's mounted flush to the body. It looks and feels well built, and of average weight. In the upper left of the photo you will see the self-timer lamp indicator, which only works in the 10 second mode. Below that and to the right is the stylish anti-shake logo which they hope will bring attention to the main selling point of the camera. Just to the right of the lens mount is the depth of field button. Push this while looking through the view finder to see how deep the focus is, make sure the camera is on of course as it operates the aperture. You'll note it may look very dark, and it will be a pain to actually determine the depth of field, especially at high F-numbers, which will allow only a small amount of light in, such is the nature of the universe. On the very right side of the picture, next to the lens mount, is the lens release. Don't forget to note the nice blue Konica Minolta logo and company names! Between the front view and top view, I'll explain the built in flash. This flash must be manually raised, even for the AF assist function. The flash guide number is 12 (in meters at ISO 100) with a sync at 1/125s with anti-shake on, or 1/160s with anti-shake off. With the available high speed sync flash units, you can set any shutter speed, and you can even take photos with the flash dismounted, wireless! 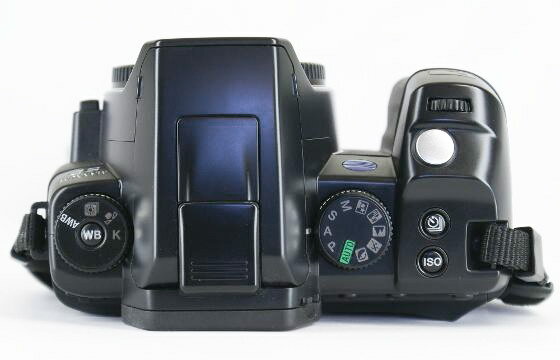 There are four basic flash modes for the 5D. Fill flash, which supplements ambient light sources; this is good for reducing shadows. Red eye reduction mode fires pre-flashes before the main flash to contract the pupils in the subject's eyes, thus preventing red eyes! Rear sync flash is used to highlight trailing marks such as car lights or subject movement. It gives a feeling of motion. 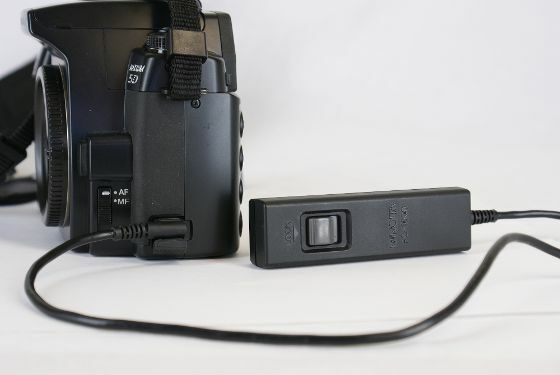 The fourth and final flash mode is wireless/remote flash which allows the camera to control an off camera flash unit without the need of cables. The AF illuminator, or more commonly called "AF assist" is used to help the camera focus in low light conditions. If the camera hunts for the correct focus, usually in a dark room or outside at night, simply raise the flash unit and allow the camera to fire a few short bursts to provide light to focus correctly. The flash will always fire if in the up position, to eliminate this, simply lower the flash after the bursts and the focus locks. 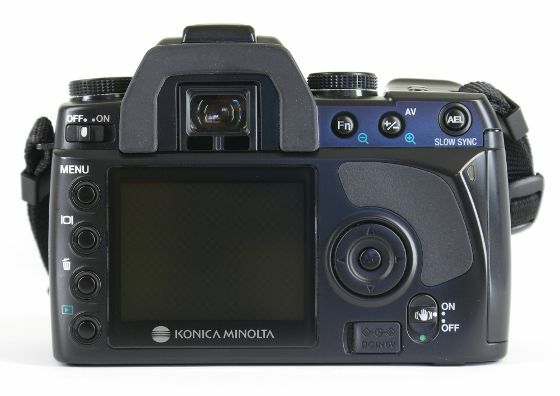 Be advised when using the Konica Minolta AF DT 11-18mm wide angle zoom lens with the flash, you will only be able to cover the 18mm length, as this is all the area the flash covers. As you can see here, things are clean and simple on the top. On the left, is the white balance dial. In the middle of that dial is the white balance button. So what is white balance and what's it about? White balance is the camera's ability to make different types of lighting appear natural. If you take a picture of a white wall, it should appear white, not beige or tan. When taking a picture of a person under fluorescent lights, the person should not look like they have a greenish cast. All this is taken care of with this small dial. AWB - white balance is set automatically. Preset white balance - set the white balance to a specific lighting source. Custom white balance - calibrate the camera to a specific lighting situation. You press the button in the middle to change the four white balance settings. Custom white balance allows the camera to be calibrated to a specific lighting situation as stated earlier. This is done by taking a picture of a white or gray card within the camera's metering area. Next up is the flush mounted flash unit. By grabbing the two tabs located on each side, you raise it up manually. In the middle of the flash unit is the accessory shoe or "hot shoe." This is where you attach a flash when the built-in flash won't do. Keep in mind on this camera you don't have to keep the flash unit attached, you can take it off and place it in a more effective position. In the picture, the cap is on the hot shoe, this is where you want it to stay unless you're using a flash. Below and to the right of the accessory shoe is the diopter - adjustment dial. This is used to correct eye sight problems. The adjustment range is -2.5 +1.0. Use this to sharpen up the viewfinder focus frame. 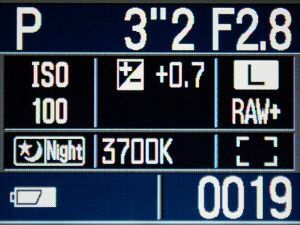 To the right of the flash, and probably the most used, is the exposure mode dial. You'll find five exposure control modes and five digital subject programs. Program exposure mode works similarly to auto, but in this mode the settings do not change, or go back to default. If you set the ISO to 100, that's where it will stay. If you want to compensate exposures manually, by using program shift on the control dial, you can. I find this setting to be one of the most useful. The digital subject programs optimize the camera's exposure, white balance and image processing systems for specific conditions and subjects. Let's look to the top right of the Konica Minolta Maxxum 5D, the first dial on the handgrip. This is called the control dial. It's used to adjust the exposure in program shift mode or shutter and aperture values in those modes. Additionally, it's used for maneuvering through the settings on the LCD monitor. You'll use this dial a lot! Exposure bracketing; to take a series of 3 images with differing exposures. White balance bracketing; to make 3 images with differing white balance from a single exposure. The last button we'll look at on top is the ISO button; or camera sensitivity button. The options are; Low80, for low key scenes, 100, 200, hi200 for high key scenes, 400, 800, 1600 and 3200. As you increase the setting from 100 to 200 etc, you double the sensitivity, a change of one exposure value, great for keeping the shutter speeds up to try and eliminate blur, of course that's in addition to the anti-shake. The right handgrip area covers the card slot door. You should take note of the card orientation in the picture; this is the correct way to insert the card, not with the front showing as I've seen in a couple of reviews. The Konica Minolta Maxxum 5D accepts CompactFlash type I and II, plus microdrives. Also inside the door you will find the video out/USB connector. The button to release the card is directly above the slot, push it in and the button will pop out a ways, then push it back in to pop out the card. Make sure you keep this button pushed in at all times, even when no card is in the slot. If you don't, you won't be able to close the card door, or you may damage the button and door in a worse case scenario. On the left side of the camera you'll find the remote control terminal. In the picture I have a remote cable attached; notice how the plug extends out to the front of the camera. It will only go in one way. For Minolta owners; the remote cord you bought three decades ago will work perfectly on the new Konica Minolta Maxxum 5D! The battery compartment is located on the underside of the camera, as is the tripod mounting socket. The battery compartment cover is hinged and spring loaded. After opening, you'll find another holder, this time for the battery itself. As you can see, the rear view shows nine buttons, an optical viewfinder, an LCD monitor, a DC-in port, an access lamp and a four way controller. Starting off on the left, is the power switch, used to turn the camera on and off, this happens in just over a second, which is pretty quick. 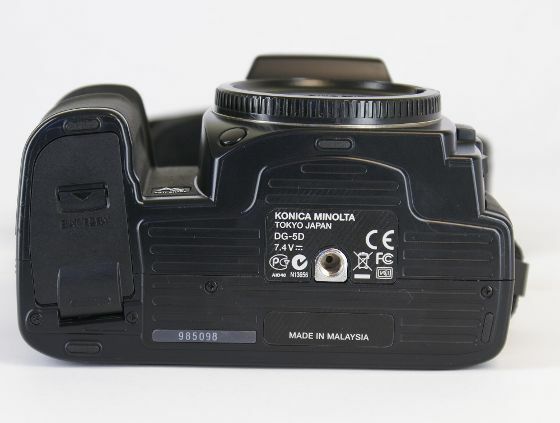 The Konica Minolta Maxxum 5D uses an eye-level fixed roof mirror optical viewfinder, which covers 95% of the actual image produced. Magnification is 0.83x. As you sight through the viewfinder, you'll notice at the bottom--a strip of information--with green digits. Information includes AE lock, focus signal, shutter speed, aperture, Ev scale, frames remaining, camera shake warning and anti-shake scale which has five bars, the higher the number of bars showing, the more you are shaking the camera and the greater the chance of a poor image. Also notice just below the viewfinder, you'll see the sensor for shutting off the LCD when you put your eye or face up to it, or when it's up against your shirt. The LCD is 2.5" with 115,000 pixels. It's bright and fairly easy to see outside in sunlight, though looking down at an angle it appears washed out. On a final note, the LCD will rotate along with the camera when shooting in the vertical position. To the bottom right of the screen you'll notice the DC port. This is used to power the camera with A/C household current using the AC adapter. You will need to purchase this item as it doesn't come with the camera. Moving up to the top again, to the right of the optical viewfinder is the "Fn" or function button. This is an important button as the AF area, focus mode, metering mode, flash compensation, color mode and digital effects control are all set here. AF area controls which AF areas are used for focus. Wide AF area, when you want the entire frame in focus. Spot AF area, for getting the focus for a single point, and focus area selection, which the operator can select manually with the four-way controller. AF mode includes single shot AF, a general purpose mode, Automatic, which switches between single shot AF and continuous AF depending on the subjects motion. Continuous, used for photographing moving subjects. Direct manual focus is similar to the automatic mode, only after the camera locks focus, the focus can then be manually adjusted. Metering modes. Multi-segment is the camera's standard metering mode, appropriate for most situations. Center weighted measures light values over the entire image area with emphasis on the center area. Spot metering uses a circular area within the center of the image to calculate the exposure. Flash compensation. The relative output of the flash can be compensated by -2.0 to +2.0 Ev. Color mode. There are 10 modes which can control what the image looks like. Natural color, Natural plus, Portrait, Landscape, Sunset, Nightview, Night portrait, Black and white, Adobe RBG and Embedded Adobe RGB. The last two are used for printing. Digital effects control (DEC) include adjustments to contrast, color saturation and sharpness. I think the sharpness would be the most useful out of the three. Right next to the "Fn" button is the Exposure compensation (AV) button. When using the Auto, P, A and S exposure modes or a digital subject program, the exposure can be compensated. To do this press and hold the AV button and turn the control dial. The degree of compensation is displayed on the monitor and in the viewfinder scale. The range is -2.0 to +2.0 in 1/3 Ev increments. Digital Effects control limits are -2 to +2 in 1 mark increments, here you only need to press the four-way controller. Just below this button you'll see a small clear plastic spot. This is the access lamp. Never remove a memory card or attached cable while the lamp is flashing red! Moving on down, you see the controller and spot AF button. The controller is used as a way to maneuver through the menu item, up, down, right and left. In the middle is the spot AF button. Push in and hold to lock the focus. Last, but not least we have the anti-shake switch. A most important item as it is the main selling point of the camera, in my opinion. 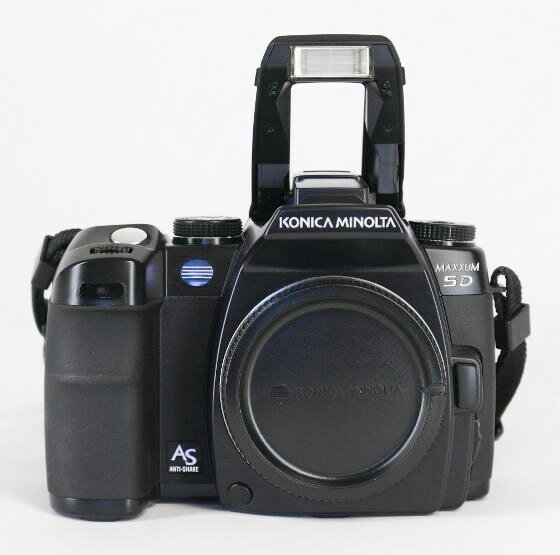 Konica Minolta's anti-shake system minimizes the affect of camera shake by moving the CCD sensor inside the body of the camera. There's no image stabilized lenses to buy, which adds up to a huge savings if you collect a few lenses, or you already own a few old AF Minolta lenses. A person may ask if the system really works. I'll show you if it works. My test shots consisted of five shots in a row of a subject, locked exposure at 1/15 second, with anti-shake on, and five shot in a row of the same subject, at the same distance and same exposure, with anti-shake off. In this case, after my tests, all five shots with anti-shake on were acceptably sharp, and with anti-shake off, only one was acceptably sharp. Check out the cropped photos. I think the anti-shake system worked as advertised. As I said earlier in the review, keep an eye out for the anti-shake bars to start building, if there're five bars you'll want to either get out a tripod, in which case you'll turn off anti-shake, or try for a faster shutter speed to avoid blurry photos. The system won't stop moving objects of course, only a fast shutter will do that job. Anti-shake won't work miracles; the purpose is to reduce the affects of camera shake. Let's talk about the camera performance. Shutter lag is no problem, as it shouldn't be on a D-SLR. I haven't said much about lenses, as it's up to you to buy whatever you want. I have a build quality issue with the kit lens though. At or near full zoom, the lens barrel has a wobble; you'll notice it while the lens is focusing. I don't think there is an optical quality problem; it's just something that's annoying. Shot to shot speeds are good, firing off a quick 4-5 shots, then slowing to a second or more between shots in the extra fine large JPEG setting. I averaged 5-6 shots in about 6 seconds, then slowing a bit to a total of 11 shots in 10 seconds. The camera's exposure levels are generally right on, but I have noticed some issues. Once in a while you'll get an under-exposed shot, maybe a half to a whole stop, even when the framing has not changed. This happens occasionally, not often. Make sure you review your pictures; you can usually tell by looking at the LCD if the exposure is off more than a half stop or more. There are three resolution settings, large, medium and small. In each setting you'll get three choices for quality; extra fine, fine and standard. You also get the RAW setting and RAW+JPEG, with the JPEG saved in the large/fine setting. I find the large, extra fine JPEG setting to be the one I use the most, but I really can't tell the difference between that setting and the large fine, at any screen size. 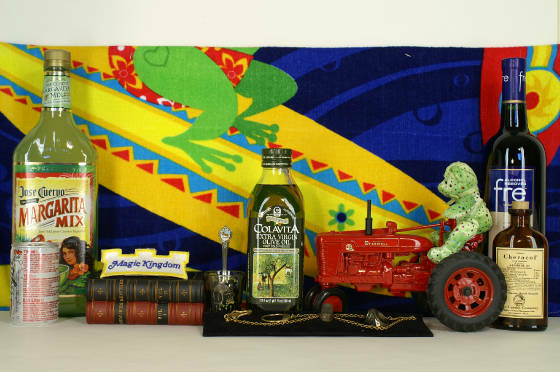 Next up is the exciting still life studio shot. The image shows nice, saturated colors which most people like now days, I think it's about right, but I wouldn't want to use the natural plus setting. As you can see, things look great all the way through 800, at 1600 things start to deteriorate, but it's still very good, and by 3200, you've got a decent 4"x 6" print. Notice the contrast and color saturation held together all the way to 3200. The Konica Minolta Maxxum 5D 6.1MP camera is the little brother to the Maxxum 7D. In some ways, it exceeds the 7D, fairly unusual but, it is the latest and greatest DSLR offering from Konica Minolta. I purchased this camera for two reasons. I have several Minolta AF lenses in my inventory, and I was also very interested in the anti-shake feature. The 5D is a well built camera; fit and finish are good for this entry-level DSLR. The buttons are located in well thought out positions and it has a nice 2.5" LCD. I think one of the main selling points is a very handy image-stabilizing devise that's built into the camera body, so all the old Minolta AF lenses, and of course all the new DT lenses will be able to take advantage of anti-shake technology. That's impressive for an entry-level sub $1000 camera. The 5D is loaded with advanced features for the expert, yet has an automatic mode for the novice. In the area of performance, the camera started up quickly, in just over a second. Shot to shot speeds were good, though not the best in this category. It'll take five shots in less than two seconds, then about one every second, which is not bad. I saw no red-eye, but that's normal for a DSLR. Focusing depends on the lens used, some are quick, some aren't so quick. The kit lens performed ok for a $100 accessory. It's not all that sharp in the corners, but turned in pretty sharp pictures at F/8. Photo quality is excellent. In the ISO department, the Konica Minolta Maxxum 5D did a stellar job in my opinion. At 3200, you won't be making any large prints, but at 1600 in daylight you could get a nice 5x7. The colors are nice and saturated; something that's becoming more and more common in default modes. Photos were well exposed most of the time, though I noticed a few under-exposed shots. Sharpness was good, but I'd crank it up a notch or two, which you can do in-camera. This camera has an auto mode, so if you're a beginner you can take full advantage of the camera's excellent photo quality. With great photo quality, anti-shake and a price tag now under $899 for the kit, it's a great buy. Kit lens not all that great, but for an additional $100 not bad. Good selection of new DT lenses. Exposures good, but not always "right on." Great price $899 or less. 6.1MP camera, competition out with 8MP.